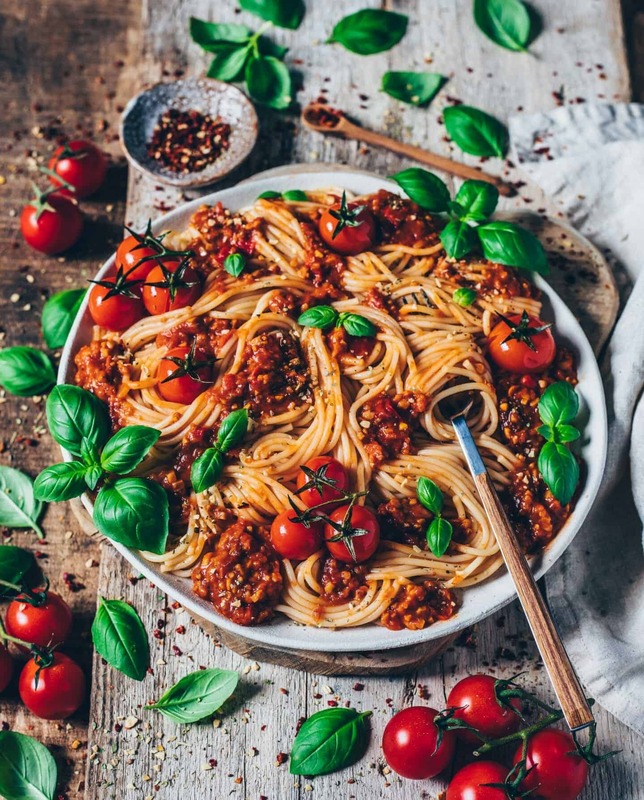 Vegan Spaghetti Bolognese – the most popular classic pasta dish, and even in the vegan version this recipe is easy & quick to make and always delicious. So it’s time to share this recipe on my blog. 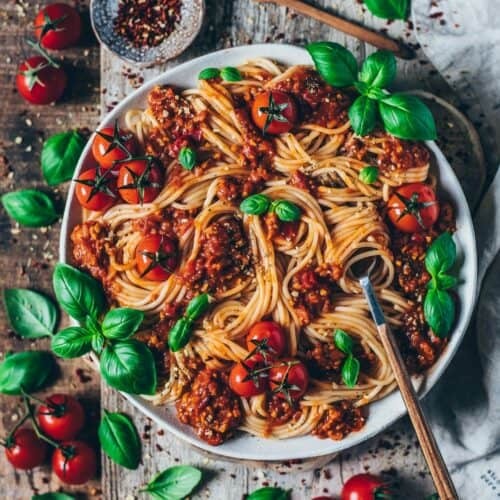 Since my childhood spaghetti bolognese has always been one of my favorite dishes ever. 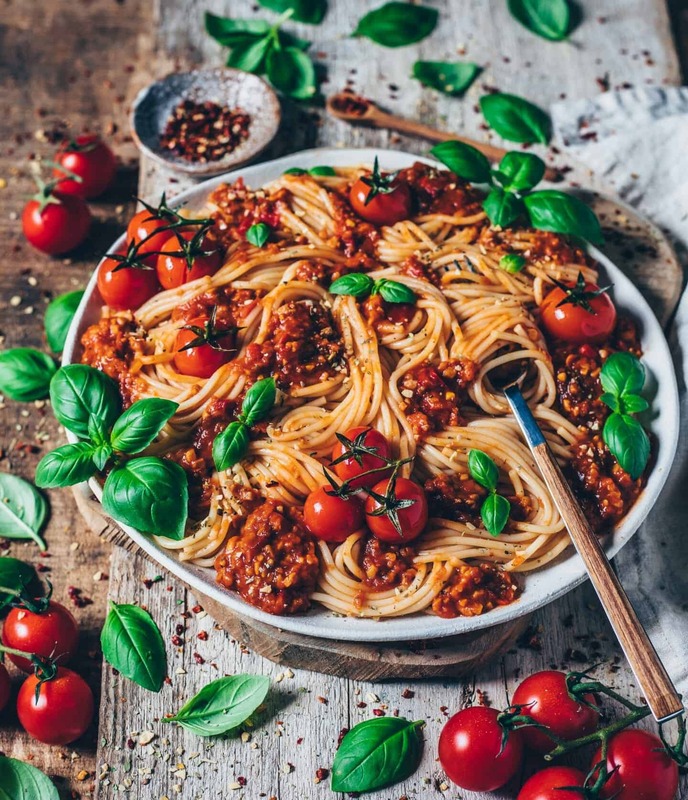 Whenever my mother or grandmother asked me what dish I wanted to eat, it was almost always spaghetti. Either with the classic bolognese sauce or with a creamy carbonara. But even with a simple ‘tomato sauce‘, I was always very satisfied. From time to time, I’ve “veganized” almost every pasta dish, because I think they taste great even without meat and dairy products. Instead of the carbonara sauce made of conventional cream, I now prefer serving my vegan ‘Mac and Cheese‘, which is mainly made from potatoes or I serve a creamy vegan ‘mushroom sauce‘ which is made from white beans. But also my beloved ‘avocado pasta‘ is on my menu at least once a week. It‘s hard to believe that I couldn‘t do anything with avocados some time ago. With this example you can really see how preferences or tastes can change over the time. So my tip to you: “Tasting is about studying!” So at least I wouldn‘t say that I definitely and never will like a food or dish. 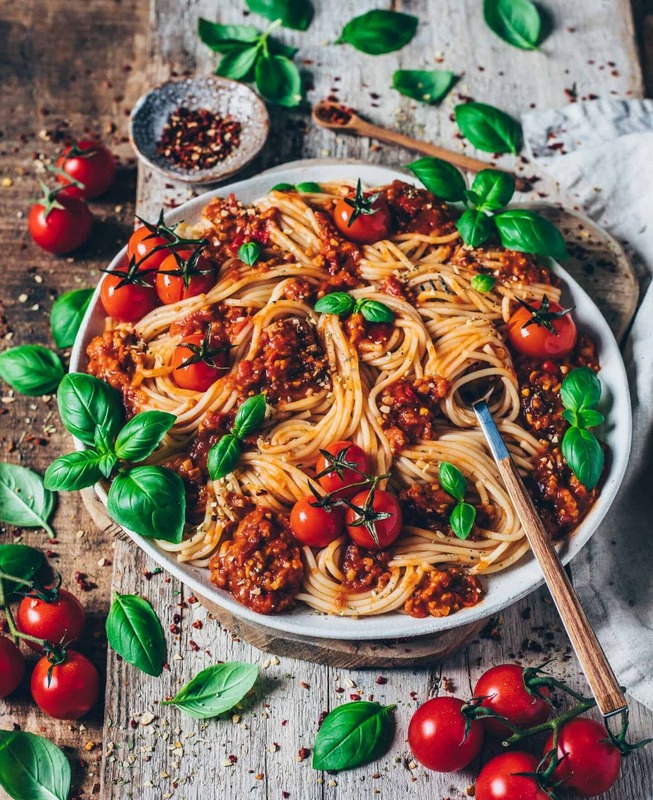 Back to the dish: fruity sun-ripened tomatoes are definitely part of an aromatic and tasty bolognese. For the sauce I prefer to mix tomato passata and sliced ​​tomatoes from the glass in organic quality, but you can also prepare the sauce completely from fresh tomatoes (depending on the season). Onions, garlic, (optional soup vegetables), good olive oil and Italian spices provide the perfect flavour. Many people often think that sugar is bad, but in my opinion, the sweet taste is just necessary for a perfect sauce. And if you use a good organic raw cane sugar, then you don‘t need to have a guilty conscience. Especially since the required amount isn‘t much as I see a lot of truth in the quote “Balance is key”! Otherwise, you can of course just leave out the sugar. With or without tofu / soy – both options are possible! As a ‘meat alternative’, I usually use normal natural tofu or soy granules / soybean shred. If you don‘t like or tolerate tofu or soy, you can also use lupine granules, seitan, green spelt grain or any other vegetable products. Meanwhile, there are already many vegan alternatives available in the supermarkets and I have already tried different variants. Just be creative and try out what you like the most! Peel onion, garlic, carrots and celery and cut into thin cubes. Squeeze the tofu (this works best with a kitchen towel) and then crumble. Heat the olive oil in a non-stick pan or in a medium-sized, non-stick pot and roast the tofu until golden brown. Add the onions, carrots and celery and fry until the onions are glassy. Then sauté the garlic briefly (for about 30 seconds). Now add the tomato paste and tomatoes and stir. Season the sauce with salt, pepper, Italian herbs and sugar and simmer for 15-20 minutes over medium heat until the sauce is well-thickened. Add vegetable broth, if necessary. In the meantime, cook the spaghetti in salted water until al dente and then drain. 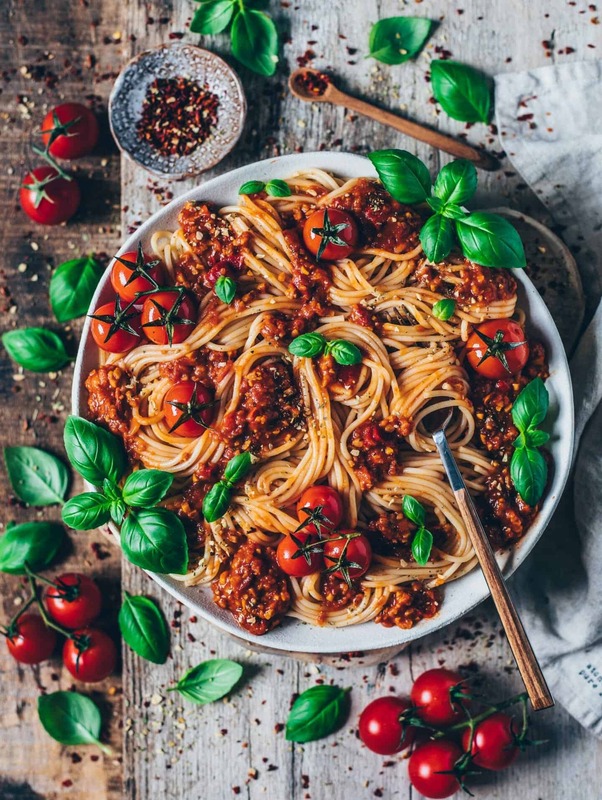 Serve the spaghetti with the sauce and garnish as desired with yeast flakes and fresh basil. Instead of tofu you can also use soy granules / soybean shred, lupine granules, seitan, green spelt, or any other 'meat alternative'. Optionally, you can make the sauce completely from about 1 kg of fresh tomatoes. I couldn’t imagine meatless Bolognese but it turns out that the vegan version tastes even better than the original one. Great idea and recipe! So glad to read that you like it! Hi! All of your recipes look incredibly delicious, I will be trying them soon! Great blog. This looks incredible! Beautiful photography and great blog! I‘m so happy that you like the recipe. Made this for dinner (served it as a spaghetti pie). Very easy and delicious. New family favourite.